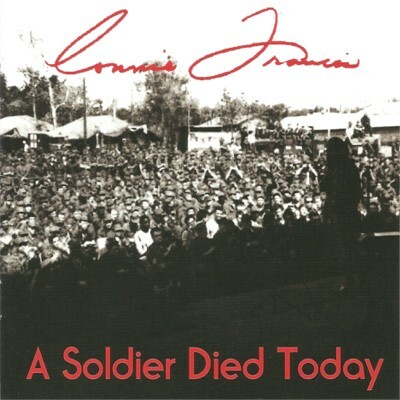 Connie Francis shares respect and stories of Veterans through song. She just sat there in the pew in the church she grew up. It was a beautiful October day and she just can not believe where she is. There she sat next to her husband and behind her mother. With a gentle hand upon her mother’s shoulder she listens carefully as the preacher tells just a bit of his story. Statistics and nothing more. The date of his birth, the date of his death, his siblings, his children and his grandchildren. Statistics and nothing more. But in her heart she wants to scream, for he had done so much more! Just six months before, he told his story. One of the most difficult interviews she had ever done in her career as a journalist was to interview her own father about the war he had served. Now six months later, she sits starring at his adorned coffin listening to her brother tell his story. If only her brother knew what she knew of how gallantly he served. Her brother was not there, when she had interviewed their parents about the war. Eighth of eleven children, that's his family. Some have gone to heaven before him and the rest sit in this church today. He had watched his brothers march off to World War II, while he stayed behind in support of his mother. Soon, it was his time to serve as he was called off to the war of his generation, Korea. Records show that he was a Sergeant First Class. But in his own words, he had earned the rank of First Sergeant. As the funeral ends and the procession begins it’s twenty-four mile journey, people don’t even stop to stare. A car cuts into the procession with no respect at all. Again she wants to scream. Don’t you people know - my father, a soldier died today! After the war, he came home and served his country again. A dairy farmer, producing milk to feed this country he had fought for. His wife was deemed barren and it broke his heart. But soon, again, he would serve his country once more. A foster parent he came to be for over 750 children, he loved and adored. Three is what they would adopt and three grandchildren is what they would produce. He lived a good life and only a handful of people knew what he had done. She watched as they laid his coffin in his final resting place. He had picked it, next to his mother in a town where he had grown up. Again, she wanted to scream! People, don’t you realize that we laid to rest my father - a soldier today? But the news papers and television shared only the deaths of an actor, a football player and a politician that day. He had served his country, not once, not twice but three times and more! Isn’t that what President Kennedy asked so many years before? Today she still mourns his death. But more so, the world had lost a great soul. For another soldier died and no one cared to know. In 1987, a very poignant poem called “Just A Common Soldier (A Soldier Died Today)” was published by author A. Lawrence Vaincourt. The powerful poem struck a chord in one’s heart as the author tells the story of a soldier who gave his all, but get’s nothing in the end. Larry was born in upstate New York, however grew up in Quebec, Canada. He had served in the Royal Canadian Air Force in World War II as a leading Aircraftsman. After the war, Larry went on to several jobs. However, his writing took center stage. He became a regular columnist and his prose has been seen across the world in various publications. In 2004, Larry was awarded the Column of The Year Award from the Quebec Newspaper Association. He passed away on April 20, 2009. In 2013, the legendary iconic entertainer Connie Francis was introduced to the poignant poem written by Lawrence by her house keeper. Ms. Francis contacted Larry’s son Randy to make arrangements to record this powerful poem. Francis thought that many of the lines in the original poem were stilted and requested permission to change them in her recording. As he sat around the Legion, tellin’ stories of the past. Of a war that he once fought in, and the deeds that he had done, Of his exploits with his buddies; they were heroes, every one. But his buddies they really listened, ‘cause they knew from whence he spoke. But we’ll here his tales no longer for old Bob has passed away, Now the world’s a little poorer, ‘cause A Soldier Died Today. No, he won’t be mourned by many, just his friends, his kids, his wife, ‘Cause he lived a very ordinary, sorta quiet kind of life. He held a little job and he raised his family, he just went quietly along his way, So the world won’t note his passing, ‘thou A Soldier Died Today. Thousands note their passing and proclaim that they were great. Yes, the news tells their life stories, from the time that they were young, But the passing of a soldier, it goes unnoticed and unsung. Is the greatest contribution to the welfare of our land, Some clown who breaks his promises and cons his fellow man? Or the ordinary fellow who in times of war and strife, Feels the need to serve his Country and he offers up his life? The politician’s stipend and the style in which he lives, Ha! They’re so very disproportionate to the service that he gives. While the ordinary Soldier, who offers up his all, Is paid off with a medal and perhaps, a pension small. It’s not the politicians, with their promises and ploys, Who won this thing called freedom that our Country now enjoys. And if you find yourself in danger, with your enemies at hand, Would you really need a politician with his daily changin’ stands? Or will you need a soldier, who has sworn that he’ll defend, His home, his kin, his Country, and who’ll fight until the end? Yes, he’s just a common soldier and his ranks, they’re growin’ thin, But his presence should remind us we may need him once again. And this country with its conflicts, just what’s the soldier’s part? It’s to clean up all the troubles that the politicians start. If we fail to give him honor while he’s here to hear the praise, then at least let’s pay him homage at the end of his days. OUR COUNTRY IS IN MOURNING, ‘CAUSE A SOLDIER DIED TODAY. Francis recorded and released this song as part of a three song EP, of the same title, in November 2013. She performs this poem as a vocal recitation and is backed by various instrumentals performing many iconic American songs. It’s the instrumentals that enhance the raw emotions of the poem. When mixed with Connie’s unique vocals, together they bring forth a deeply moving song that will certainly haunt your soul. This song is sure to hit our list of Top Songs of 2014, thus earning a nomination for the Spirit Award’s Song of The Year award. Connie Francis is no stranger to Veterans. Since she was ten years old, she has been performing for Veterans. As a young girl, Connie would sing and play her according in various Veteran’s hospitals. In December 1967, at the height of Connie’s career, she toured various bases and hospitals in Vietnam. She would come to celebrate her 29th birthday among the troops. “A month. A little under a month. I went there by myself. There were a few entertainers like Martha Raye and Nancy Sinatra. We went there by ourselves. I went there - my main reason was to bring some comfort and a little bit of home to those poor guys.” tells Connie about her trip to Vietnam. “It was the most satisfactory, heart warming experience of my life. It was the most life alternating experience of my life. It was just amazing. I never had that kind of thrill before. But even more so was to go to those MACV [Military Assistance Command, Vietnam] hospitals and see these kids with half a face, burned and just put my arms around them. In 1973, Connie released a song called “The Answer (Should I Tie A Yellow Ribbon Round The Old Oak Tree? ).” The original version of this song was called “Tie A Yellow Ribbon Round The Old Oak Tree” and was recorded by Tony Orlando. Ms. Francis went to one of the song writers, Irwin Levine, and asked if she could write an answer to Tony’s song. Within two days Irwin wrote the song for his grammar school mate, Connie. The synopsis for the original version told from the point of view of a prisoner who has completed his sentence but is uncertain if he will be welcomed home. Where as in Ms. Francis’ version, she makes the song more personal about a loved one. The idea of the ‘yellow ribbon’ as a remembrance begins around the Civil War when women would tie a yellow ribbon in their hair to signify their devotion to a husband or sweetheart serving in the U.S. Cavalry. However, the symbol became widely known in civilian life in the 1970’s with the release of the songs. It was a reminder of a loved one who served or was in jail, and their hope of a safe return. Many have researched and written articles about this American folk tale. The result is a wide variety of tales with in its self. Connie’s version stems from a soldier’s return. Although she includes the original 1973 recording of this song on this EP, she is currently working on re-recording and re-releasing it again soon. Today, Connie Frances is on a mission to help Veterans and their families. She hopes to build a community and provide programs for Veterans, returning soldiers and their families. She hopes to promote expert help to soldiers and Veterans who suffer from PTSD, Post Traumatic Stress Disorder, to help them prepare for what lies ahead in their lives. Portions of the sale of this EP will benefit the charities that Ms. Francis is currently working with to achieve her goals. Ms. Francis is also gearing up to release a new tell all book of her life, soon. But in the mean time she asks that everyone call their radio stations to request her song “A Soldier Died Today” to play on the air. She still can not believe that her father is gone. She still expects him to come knocking on her door to sip on a freshly brewed cup of coffee while they visit. Today, the only thing that marks that he had lived is written on his tombstone. The simplicity of the year of his birth and the year of his death can not tell the story of his life. On the back of his gravestone is a commemorative plaque that shows that he had served in Korea. Even on that plaque it states he was a Sergeant First Class. He was a quiet man. But in her heart he was her hero of a soldier.